Measure 37 Claims as Contracts? The ballot measure Measure 37 required counties to either compensate landowners for money lost due to land use restrictions or to waive land use laws that prevented them from developing their land. In Oregon, around 7,000 claims were made, which cost counties across the state significant amounts of money. When voters passed Measure 49 in 2007, only those Measure 37 claims that had "vested" were still valid. In other words, only where claimants had undertaken a significant amount of work on whatever development was allowed to go forward under the Measure 37 waiver could proceed. In Jackson County, around 570 claimants whose claims had been denied due to a lack of vesting appealed the county's decision to federal court on constitutional grounds. The group, Citizens for Constitutional Fairness, filed an appeal on behalf of these claimants. The federal judge held that the Measure 37 claims were contracts with the county and had to be enforced. See November 2008 Mail Tribune article: Judge Backs Measure 37 Claims. Jackson County, Rogue Advocates and other conservation groups appealed this decision to the Ninth Circuit Court of Appeals. All the groups seek to protect farmlands, forestlands, open space and the diverse wildlife habitat that inhabit these special places, and sought to keep the Measure 37 claims from moving forward and damaging these important places. At stake in Jackson County alone were 60,000 acres of resource lands. On July 20, 2010 the decision finally came down from the 9th Circuit. In an eight sentence opinion, the panel of appellate judges struck down Judge Panner's decision, holding firmly that the Measure 37 waivers were not contracts between Jackson County and the claimants. 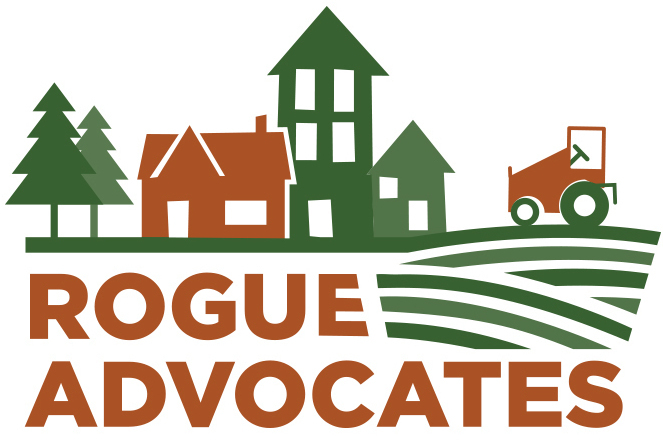 This is a victory for Rogue Valley residents and for Oregonians as this decision prevents the re-opening of 7,500 Measure 37 claims proposing development on over half a milion acres of farmland, forestland and open space across the state. Read our CRAG Law Center attorneys' press release on the decision: Local Residents Hail Ruling. . .